Baklava is one of the greatest desserts ever created. I truly believe this. There is something about taking a bite into that flaky, crunchy treat. Oh how I wish I could figure out how to make a gluten free phyllo dough! While I can’t (yet) make it paleo friendly, I can make it nut free for all my nut allergy peeps. I wondered what would be a good substitution for nuts that would still give it a slightly nutty and crunchy texture. Finally I realized sesame seeds would be pretty close. 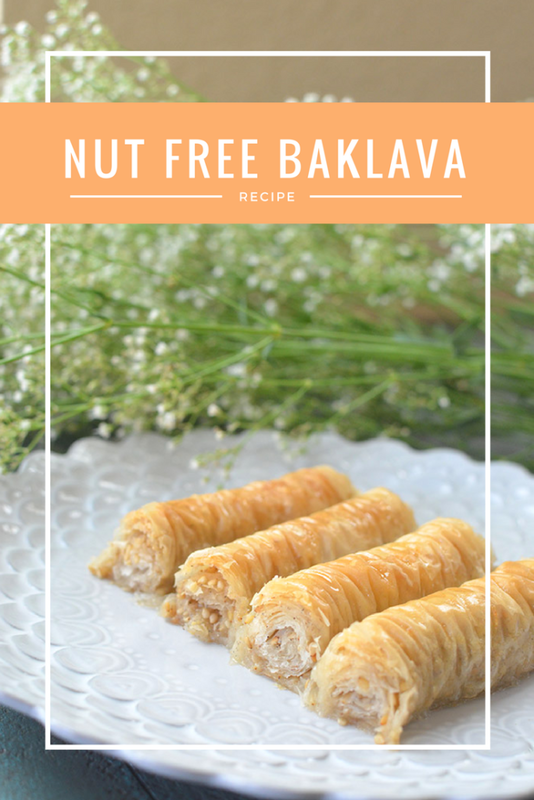 Thus, my nut free baklava was born! This recipe is a rolled style baklava and I’ve added a nice cardamom touch. 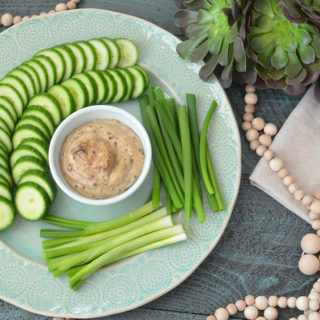 I served this to a few friends and family who had nut allergies and it was a definite go! 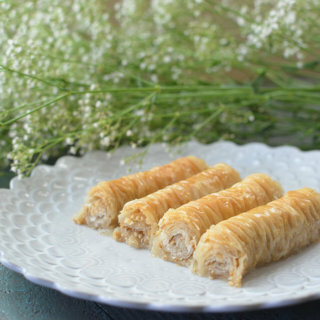 Eventually, I’ll work on a greek style nut free baklava and share that with you too! If you’re worried about working with phyllo dough, I want to tell you it’s okay. Take a deep breath, you can do this. While phyllo dough is a tiny bit more complicated to work with because it’s thin and dries quickly, if you are gentle with the dough and if you fold it over back into the plastic covering, you should be fine. Yes, I’ve had my share of rips in the dough, and yes, my dough has dried out on the edges at times (usually nothing butter can’t cure). It’s okay. The more you work with it, the more comfortable you’ll feel with it. 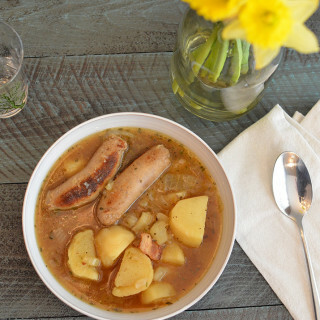 100% give it a try! Here is your filling. Three very simple ingredients: sugar, sesame seeds, and cardamom. 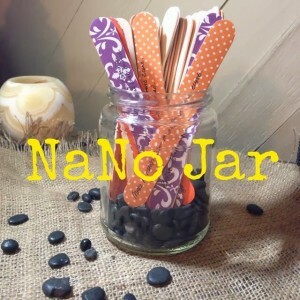 Just mix these together so they can sprinkle on evenly. 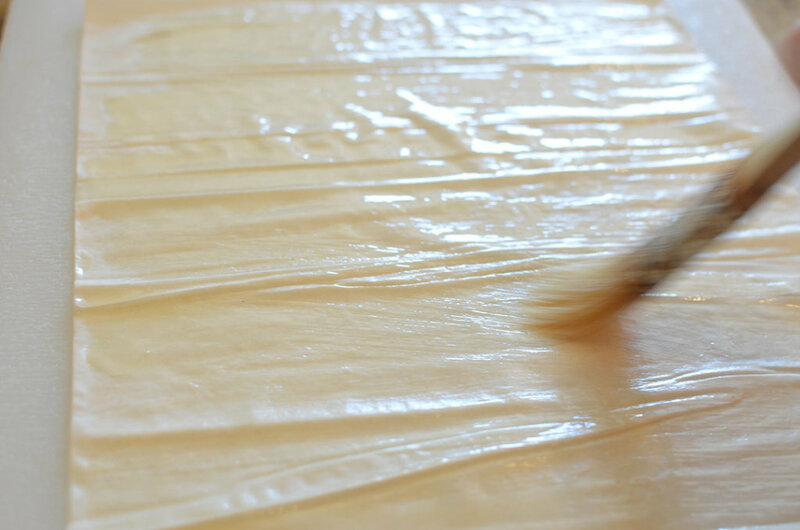 You’re going to take two sheets of phyllo dough (still stacked together) and lay them onto your work surface. Take your melted butter and brush the top layer until shiny and lightly covered. Once you’ve coated your phyllo dough with butter, sprinkle your filling mix onto your phyllo sheet. Make sure you don’t add too much or it will rip when rolled. Wait a minute?! Is that a chopstick? Yes it is! This is how we’re going to roll the baklava into little fingers. Place the chopstick at the bottom of your sheet of dough. Slowly and carefully, roll your dough around the chopstick. When you reach the top, with both hands, you’re going to squish the dough towards the center of your chopstick from the left and right sides. This might take a bit of practice, but you’ve got this! Pull your chopstick out and place the baklava in an ungreased baking dish. Once you’ve used up all your dough and your little desserts have made it to the baking dish, take your melted butter and pour it over the rolled baklava. Cook in the oven for about 30 minutes or until golden brown. While these cook, make your syrup. You will take your sugar and water, place them in a pot over medium heat and stir until the sugar has dissolved. Put aside. 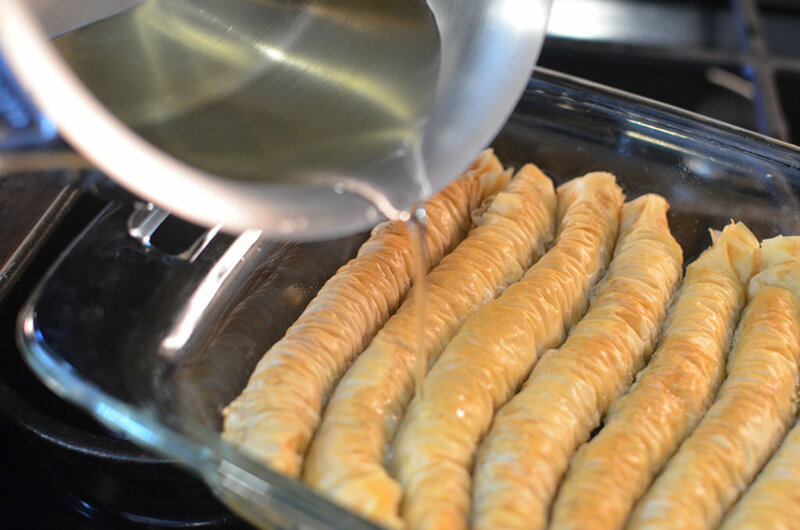 When your baklava is done, pull them out of the oven and pour the syrup over them while they’re still hot. You should hear them sizzle. IT IS SOOO IMPORTANT TO NOTE, DO NOT USE ALL THE SYRUP!!!! If you use all the syrup you might end up with a soggy dessert. You do not want that. Pour over slowly and allow to soak in. Add more as time goes on and the dessert cools. There you have it! Nut free baklava, ready for all to enjoy! A delicious and flakey baklava with a cardamom touch–completely nut free! In a small saucepan, heat the sugar and water on medium low, gently mixing. 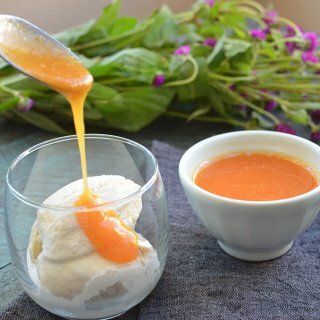 When sugar has dissolved, turn off the heat and set aside. 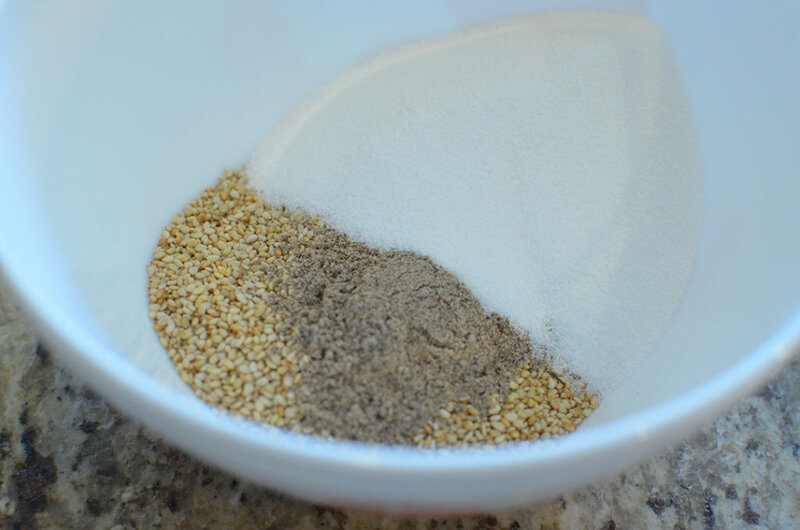 In a small bow, mix together sesame seeds, sugar, and cardamom. Set aside. Melt 4 TBSP of butter in a small bowl or cup. Set aside. Gently take two sheets of phyllo dough and lay it on a flat surface. 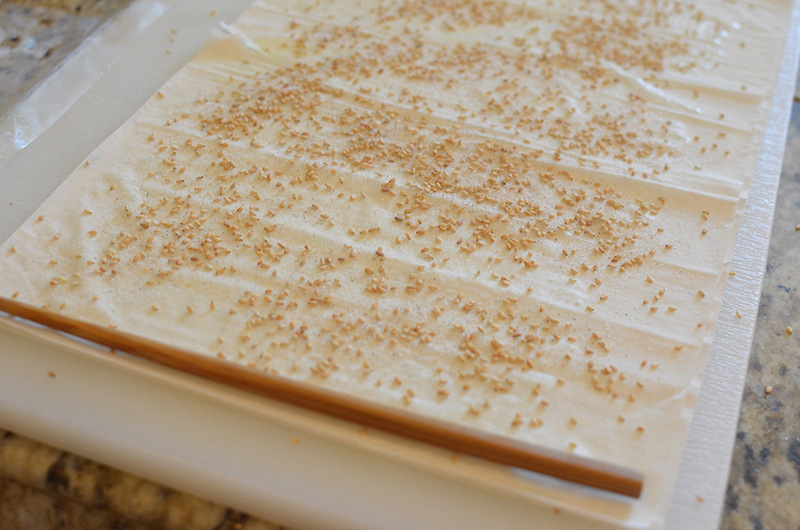 Quickly use a brush to butter the top layer of phyllo dough. 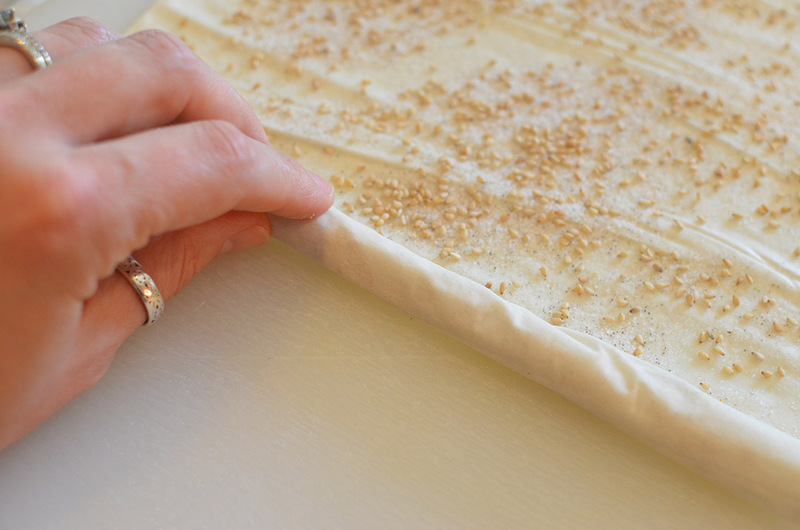 Sprinkle the sesame seed mix on the buttered surface. 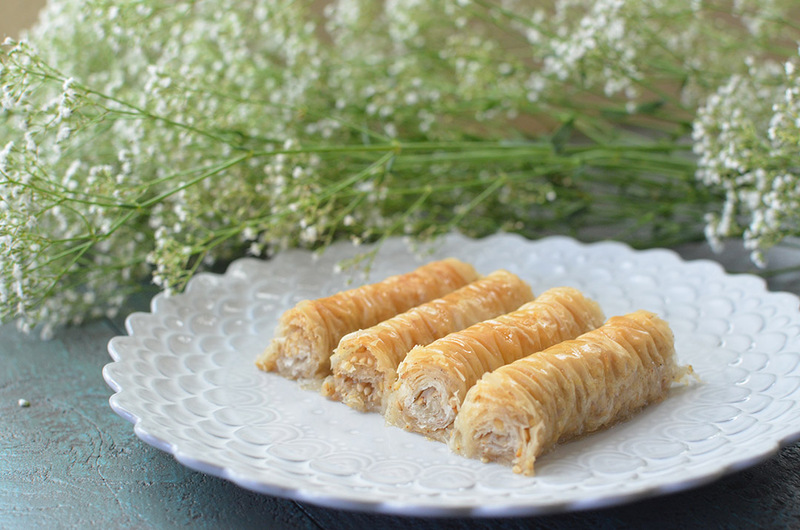 Using a chopstick, you will be rolling the phyllo. 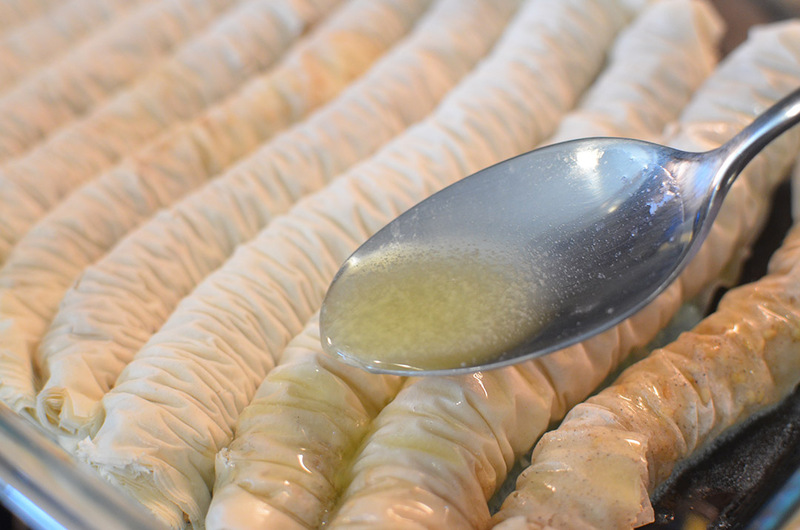 Place your chopstick at the bottom of phyllo dough and gently roll up. When you’ve reached the top, you will push in the left and right sides of dough on the chopstick until your baklava has a wrinkled look. Pull the chopstick out, and place the baklava in an ungreased baking dish (I used a 8 x 8). Repeat the process until you have used your entire roll of dough. Melt 4 TBSP of butter and pour over baklava. Place in oven and cook for about 30 minutes or until golden brown. When the baklava is done, pull it out of the oven and pour cooled syrup slowly over the still hot baklava. DO NOT USE ALL THE SYRUP. Pour enough syrup for the baklava to absorb. This may take a few minutes. When it no longer absorbs syrup, stop! If you use too much syrup the baklava will be mushy.